The 2017 Hyundai Sonata adds CarPlay, adaptive headlights and streamlined option packages, sweetening a car that hardly needed it. The 7th-generation Sonata has earned critical and sales acclaim since it was introduced in 2015. Factor in the two hybrid models, including the plug-in with up to 27 miles of EV-only range, and the Sonata is a compelling family of sedans. I have had the car for 2 years. I haven't had issues. Maybe twice it wouldn't start and I had to shake the steering wheel to get it going. The car has taken a lot of abuse from my lack of good driving, and it is still in one piece. It feels lightweight on the highway, like the wind could blow it over. It is inconspicuous. I sometimes hear a rattle when accelerating. It could've been caused by something I have done. The car is pretty good with gas. My driving cost me about 5 bucks a day. I runs quiet. Sometimes you forget that it is on or you can think it is on and it is really off. The windows are sturdy because they withstood me trying to break them with my foot or a rock. I 'd locked my keys in the car and wanted to get in. One thing I really do not like is that you cannot lock the car while it's on with no one in it. So when I am warming it up in the winter, I have to hope no one jumps in. The tires and rims withstood a lot of abuse from sudden pot holes. Sometimes I do not know how that car could still be in one piece. It's secure in a way that if car door is open without keys, it would have theft protection to stop the trunk from opening. This good for theft prevention but inconvenient in situations where you really need something from the trunk. It requires an oil change every 7500 miles, but the oil change mechanics will suggest an oil change every 3000 miles, contrary to the suggestion of the manufacturer. It is low maintenance and has enough horsepower. It looks to be small in size, but it is actually pretty roomy, especially for a mid size car. I like the pick up in speed when I use the spirit drive. It really makes up for not having an actual v6 engine. I traded in my Hyundai Elantra for the sport to have more room in the back seat to accommodate 2 car seats and 1 other person I am very happy with the space. I also like the fabric on the seats my daughter smeared chocolate on the seat and I used a damp cloth and it wiped right off without leaving a stain and my seats are tan. I like the stereo options the hands free talking and the media option I get to listen to music from YouTube when my phone is connected to the car. however the Bluetooth system in my car is questionable, meaning I have to put my phone on speaker phone sometimes because the person n the other lie cannot understand me. They tell me that my voice is going in and out I did not have this problem with my Elantra. I love the low profile body of the car and the lights it looks awesome after a fresh wash. Everything is at my fingertips in this car. It handles the road very well and the braking system is excellent the car stops on a dime and it stop well in the rain as well. The trunk is very spacious which is awesome for our family road trips. We usually rent a car for our road trips, however this past summer we drove our car and we were pleasantly surprised at the comfort level when driving a long distance. 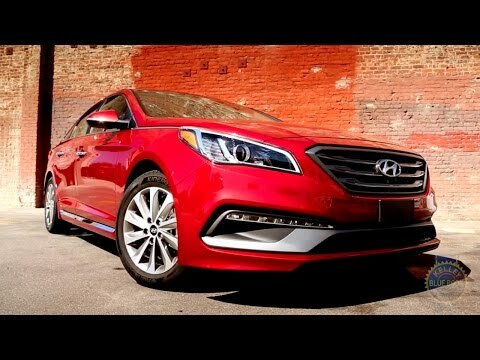 The 2017 Hyundai Sonata, roomy comfort in a sleek and stylish sedan. I have a 2017 Hyundai Sonata. It is dark blue and beautiful! My Sonata does not have all the bells and whistles, but it is not bare bones either. I adore my Sonata. It has some really fantastic features, my favorite being the “range” display. If you've ever run out of gas in a vehicle before, you will love the “range” feature in newer vehicles. It tells you how much further you can go before you run out of gas. There are quite a few lovely features that come stock with newer vehicles. My Sonata also has an “eco” and a “sport” mode, that can be switched easily with the push of a button. “eco” setting gives you better gas mileage, and the “sport” setting gives you less mileage but much more power. I use both the settings, but definitely use the “eco” setting more often. I haven't had an issue with reliability. Hyundai’s are good cars and last well over 100, 000 miles, if taken care of. The comfort of the Sonata is unmatched by any other car I have driven. There is ample room in the back seats, and the front seats too. Tall people will not be folded and squished, and there is room for 5 people to sit comfortably. I highly recommended the Hyundai Sonata!